PHILLY'S MUSICAL future arrives this weekend, as the diminutive, intense and charismatic Yannick Nezet-Seguin (Yah-NEEK Neh-ZAY Say-GAN) leaps onto the podium. He'll lead three concerts, his first since being named the Philadelphia Orchestra's music director-designate in June. After the elegant formality of Haydn's "Military" (Symphony No. 100) and Mahler's huge, rambling Fifth Symphony, his three concerts will undoubtedly end in an eruption of welcome. He'll return the favor by greeting audience members after each concert in the Kimmel Center plaza. Orchestra's new plan: Advance or retreat? 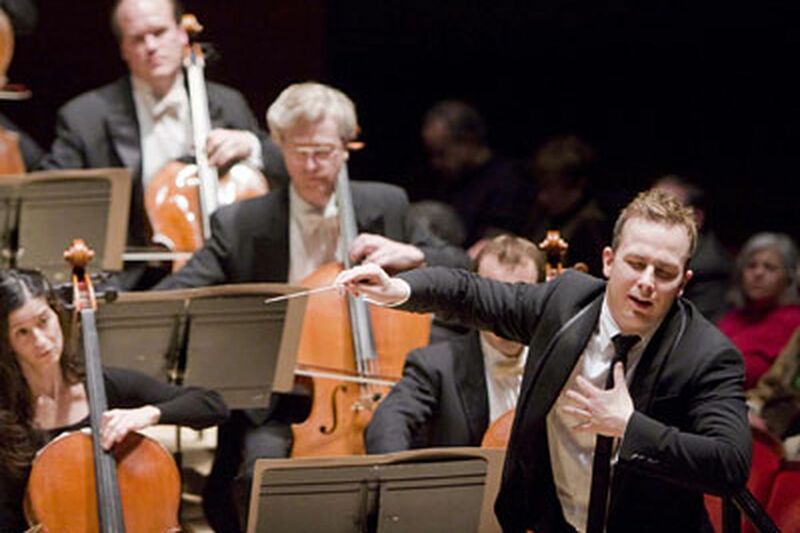 Only the eighth music director in the orchestra's 110-year history, and the first from North America, YNS (as he is called in his native Montreal) is a 35-year-old, 5-foot-5 dynamo. He guest-conducted only one program in each of the past two seasons, but that was enough for the musicians and management to realize a personification of the future. Personable, gifted and full of youthful energy, he impressed the musicians with his collaborative attitude and obvious natural talent. Many players insist they can tell in eight bars whether a new conductor has "it" or not, and Nezet-Seguin obviously had it. He's arriving to lead an orchestra that, under the recent guidance of chief conductor Charles Dutoit, has developed the astonishing ability to adapt to the unique styles of guest conductors. The musicians perform at a supreme level with an immense pride, ready for this new leader. Nezet-Seguin's name derives from his father, Serge Seguin, and the later adaptation of his mother's name, Claudine Nezet. At age 10, he was so impressed by hearing our Charles Dutoit conducting the Montreal Symphony that he immediately realized his destiny was to be a conductor. During summers, he studied choral conducting at Westminster Choir College in Princeton, N.J.
Dutoit happened to attend the Montreal Opera's "Barber of Seville," in which Nezet-Seguin was making his debut as the chorus conductor, and was impressed enough to offer him a two-week guest-conducting opportunity with the Montreal Symphony. Nezet-Seguin considers as his mentors Dutoit and the great Italian conductor Carlo Maria Giulini, who allowed the young man to assist him for a year of European touring. This season, he'll lead only this week and another in January, performing the Mozart Requiem in January. He conducts five weeks next season and will officially become music director in the 2012-13 season. His home is Montreal, where he resides with his partner, Pierre Tourville, a violinist in the Orchestre Metropolitain. Current commitments run through 2015 with that hometown orchestra, until 2015 as principal conductor with the Rotterdam Philharmonic, and through 2014 as principal guest conductor with the London Philharmonic Orchestra. Next week he'll head to the Metropolitan Opera (where he led last year's smash, "Carmen") to conduct Verdi's massive "Don Carlo," and will soon debut at Milan's La Scala. What will develop five years from now is hard to predict, but Nezet-Seguin intends to gradually cut back guest appearances. He has repeatedly said that the best orchestra he knows is in Philadelphia - a city that hasn't had a music director who lives here in 30 years. We caught up with the busy Nezet-Seguin by phone in Berlin, where he was about to debut with the Berlin Philharmonic. Q: What sound or characteristic did you hear with this orchestra that made you want to do more with them? A: I will always remember their ears and the sound, both intimately connected with the degree of passion and commitment I received from the musicians. In our first morning rehearsal with something they know intimately, Tchaikovsky's Sixth (Symphony), they were never a slow machine to be turned on, they were completely dedicated. They responded to anything I would ask in hands and eyes. We must value the rehearsal process - that's what I need. Q: What makes an orchestra great? A: The great quality of an orchestra is to be adaptable. Our main goal as musicians is to serve the composer, to do research and give whatever is required to retain the personality and requirements of the style. For instance, within the parameters of style, one cannot play Mozart the same as Tchaikovsky. Q: What is the conductor's role? A: I think the teaching of conducting is too much oriented toward asking. Yes, we must give a clear picture. But even more important is how we react to the sound they're producing. We should show as much as listen, and model this in real time. There's no recipe for making music, because if it wasn't always different, why would I be traveling? Q: How do you feel the musicians reacted to you in past visits? A: There was no resistance at all to anything I suggested. Sometimes there's a weight of tradition which an orchestra carries. But these musicians were completely willing to explore something new. Q: Will you do concert versions of operas like [previous music directors] Muti and Sawallisch? A: We're already in discussions about that. Every great conductor also conducted opera: It's part of the same conception of music, asking every instrument - even the timpani! - to sing, with the voice as the primal instrument. I believe that working in opposite styles makes every style clearer. Q: Do you still play piano? A: Not as much as I would like! But playing is good for me, because it helps me remember what I'm asking of the musicians, to be conscious of the process of music-making. Q: Is there repertoire you'd especially like to conduct in future years? A: I'm omnivorous about music, so everything, including new works! But this current program is representative of what I'd like to do. Haydn is cleansing, with invention pouring from every bar. His music always puts you back in good health, with his life experience so directly in his music, the essential sense of orchestral playing. And the Mahler is a wonderful, personal journey, making an excellent contrast that only great orchestras could manage. Q: How do you feel about the orchestra's new live broadcasts to theaters? A: Nothing can replace the physical pleasure of experiencing music as closely as possible. But this is part of the future, to show its accessibility for people of any age. We have to eliminate the general conception that this is an art form for only the people who know about it. And the Met live telecasts have generated more people to actually go to the Met. Q: Is it possible for the Philadelphia Orchestra - historically first in recordings, technology and famous tours - to regain its primary international reputation? A: As strongly as I wanted to have this position, I must tell you that if it was not for that possibility, I would not have taken it. We must get people into the hall, and get the word around like it used to be. Because we absolutely have the capability to achieve this - by just being the best. Verizon Hall at the Kimmel Center, 8 p.m. Friday and Saturday, 2 p.m. Sunday, $39-$125, 215-893-1999, www.philorch.org.